WHAT IS IT? As the world becomes more and more computerized, the days of girls scoring races with pencils and notepads have disappeared. Today, all Professional and most Amateur races are scored by electronic transponders. It is basically the motocross equivalent of groceries being scanned at the checkout counter. Every time a bike crosses over the wiring buried in the track, the transponder sends that bike’s information to a computer in the scoring tower. It is clean, simple, fast and virtually foolproof (save for dead batteries, lost transponders, computer glitches and riders who forget to put the transponders on their bikes). Lightspeed, best known as the supplier of carbon fiber parts to the factory teams, makes a line of carbon fiber transponder holders. Their latest snap-on version is the easiest and simplest to use. WHAT’S IT COST? $79.95 (snap-on), $65.95 (bolt-on). CONTACT? www.lightspeedperf.com or (714) 990-5767. WHAT STANDS OUT? Here’s a list of things that stand out with the Lightspeed snap-on carbon fiber transponder holder. (1) Design. 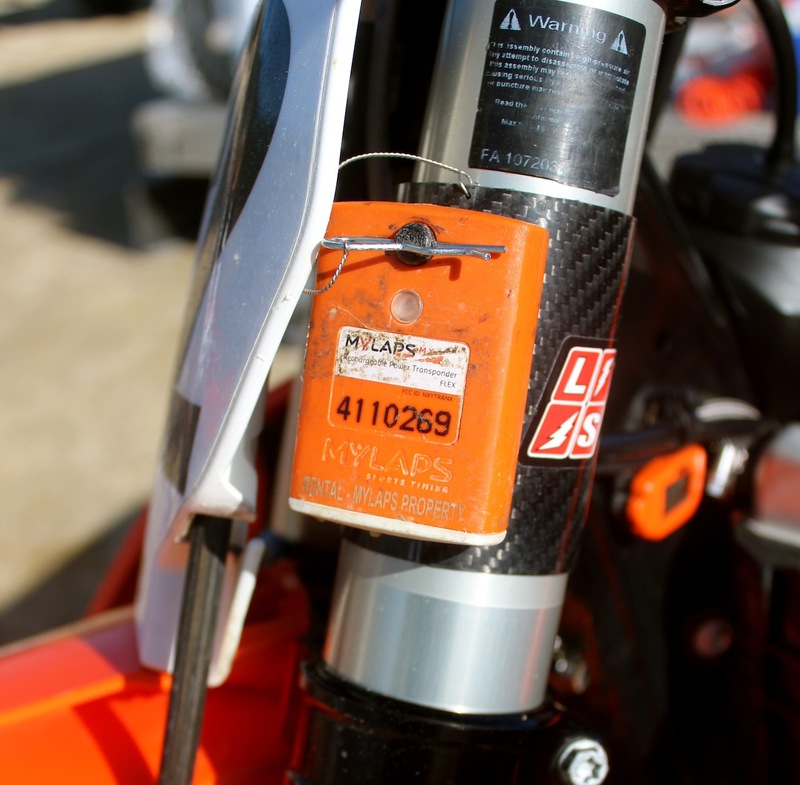 Electronic scoring requires a transponder to be mounted on the motorcycle. Typically, this is done with a plastic bracket that zip-ties around the fork leg between the top and bottom triple clamp. This works fairly well, but there is the danger of the transponder spinning on the fork tube and getting wedged between the triple clamp and head tube‚ which could lock your steering. As a failsafe, most racers put duct tape around the holder just in case the zip-ties slip. That is like wearing suspenders to hold up your belt. Lightspeed makes carbon fiber transponder holders that bolt to the top triple clamp using the existing pinch bolts. On bikes with the pinch bolts mounted on the front side of the clamps (Honda, Yamaha, Suzuki and Kawasaki), this puts the transponder behind the front number plate and out of harm’s way; however, on bikes with triple clamps with rear pinch bolts (KTM and Husqvarna), the mounting is more complicated. Originally, Lightspeed stuck with using the pinch bolts on the Austrian bikes, but with the transponder mounted sideways behind the triple clamps. It looked like it would work, but the electronic signal was often blocked if the wires were buried too deep in the ground or if the bike were leaned at too steep of an angle. Positioning the transponder behind the triple clamps instead of in front of them meant there was too much metal between the transmitter and the receiver. So, for KTM and Husqvarna owners, Lightspeed built a snap-on transponder holder that snaps around the fork leg (between the triple clamps) to allow the signal a clear path to the underground conduit. Think of it as a set of carbon fiber fork wraps that have been downsized and repurposed to hold a transponder. (2) Installation. The snap-on transponder holder is a breeze to mount. Just spread the carbon fiber tube apart and slip it over your fork stanchion. The transponder sits on a hook and slips over a post. A linchpin goes through the post to secure the transponder in place. The major differences between the plastic bracket and the Lightspeed bracket are the material and the mounting system. As far as the electronics go, it doesn’t matter which side of the bike you put a transponder on, but the Lightspeed unit is designed to go on the left side of the bike, below the top triple clamp and behind the front number plate. In our photo we moved the transponder out from behind the front number plate so it could be seen, but you should always hide it behind the number plate to protect it from roost. (3) Choice. Since Lightspeed offers two types of transponder holders, you have a choice—although KTM and Husqvarna owners must use the snap-on system. There is nothing stopping Honda, Yamaha, Suzuki and Kawasaki riders from using the snap-on holder, but we think that racers with front-mounted pinch bolts are better served by the bolt-on model. Not only is it more secure, it mimics exactly what the factory stars run and is also $14 cheaper. WHAT’S THE SQUAWK? We don’t like the braided-steel safety wire that holds the linchpin. It is stiff and ungainly, but we have broken many of the plastic lines on the stock transponder holders, so it’s a push. Additionally, if your race promote ris charging you to rent a transponder from him, he is ripping you off. It is obvious that when you pay the entry for a race, being scored is part of the package. To charge you extra to be scored is shady business. Yes, we know, that investing in transponders is expensive, but in that case just raise your entry fees to cover the cost of duty business. There are lost of tracks who hand out transponder at sign-up without charging extra for them (although they often want you to leave your driver’s license with them to insure that they get the transponder back). That’s all well and good, but tacking on additional fee is low rent and everyone can see right through it. MXA RATING: If you race every week at a track that uses transponders then the LightSpeed transponder holder is a valuable product. It is easy to remove, is easy to install, more secure than the typical plastic holder and works on KTM and Husky forks.